There are upgrades happening on all the vehicle card readers. If you ride Muni buses, you will notice a small white sticker on the right side of the reader. From the looks of the sticker, TransLink has upgraded the memory and the battery backup for their equipment. The memory upgrade is a big plus and I find the readers to be even more responsive than before. As for the battery backup, it's a feature you will hardly notice. Another improvement is their response time for history reports. Instead of waiting several business days in the past for card transaction history reports, users can still make their request online and TransLink will e-mail you your history report within a matter of hours. My last request only took four hours, a dramatic improvement. TransLink claims they automated the online request process and will result in reports being generated within 24 hours. The card readers are still very unreliable on the F-Market cars because they are either not turned-on, have the red light with the "DC Not Responding" message, or the readers constantly trying to restart but continuously failing to operate in normal condition. I feel it is possibly due to the age of the vehicles, frequent power fluctuations (the lights flicker on the train when the overhead wires cross another wire); the SFMTA claims it's due to a power related problem. A second problem is Muni has not installed TransLink readers on their remaining F-Market vehicles that are not the PCCs and Milan cars (e.g. "boat" car, "Desire," and Melbourne). These are the "rare" cars that typically don't operate on Market, but run the shortened routes from Fisherman's Wharf to the Ferry Building. While the card user report is being generated at a much quicker pace, there's a need to allow the website to access immediate viewing of history reports instead of waiting for an e-mail. While I understand the TransLink management board is talking about our city's Cable Cars having portable card readers, Muni will never be fully TransLink ready until all the cable car conductors have the technology with them. I have a monthly Muni pass on my TransLink card, but I can't use them. If fare inspectors and Caltrain conductors have the new wrist strapped card readers, where are they for the Cable Car conductors? Is there a plan to install stationary TransLink card readers at the 4th & King metro platform for after AT&T Park sports events? If TransLink is in full swing on Muni and there's thousands of cardholders riding the metro, wouldn't it be beneficial to have an express line or an easy way to simply tag at the platform entrance and board the trains? Currently, the fare inspectors usually tell cardholders to tag on the trains, but due to the sardine packed crowds on the train, you may not get a chance to tag your card. I'm wondering if the placement of the TL readers on some of the F-Market streetcars are a factor in their wear and tear. More than once, I've had to ask someone leaning up against the machine to move so I can tag my card. 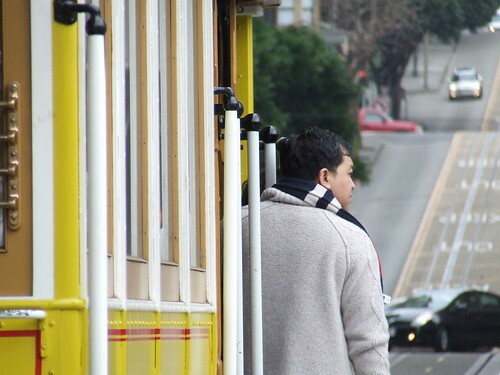 F-Market is typically used by tourists and they have a tendency to not move to the back of the train car. They usually stand between the front and rear door. Another thing they need to improvement on is the distribution of Youth TL Cards. I've ordered mine in October and I STILL haven't received my card yet. I still believe that there should be many improvements with the TransLink system. When I was in Japan last summer, I bought a Suica, a smart-card for the Tokyo metro and regional railway systems (JR East) just to test it out. It definitely put TransLink to shame. First, it is accepted on any transportation system in the Tokyo Metropolitan area. TransLink brings up that is difficult to coordinate several transportation onto one card. If we look at Tokyo, however, there are dozens of transportation companies that accept the Suica and it is also interchangeable with other transportation networks outside the region (for example the ICOCA card on JR West can be used on JR East's Suica readers and vice versa). Second, the rider history is instantaneous. Just tap onto any add-value machine (which are located in every transit station), and use the request history button. It will print out onto a receipt size paper all your tap-ins and tap-outs within the last few days. Third, the card is read in less than a second so that you don't have to slow down your walking pace when going through the faregates. Because of the high number of people entering and exiting the train stations, if it took as long as the TransLink card to read, there would be congestion around the faregates. In fact, many JR East faregates are left open, and if there is an invalid ticket, they will suddenly close. Finally, there is integration of transit and commerce. Tokyo was smart to combine shops with transit station. Transit stations have a steady flow of people, and high traffic of pedestrians usually allows for better business. The Suica is accepted at all station shops making it easier for commuters to complete their purchases. Great insight into the Suica card. On your first argument, it's difficult for TransLink to coordinate with all the transit agencies; I believe many of them are hard headed and don't see the bigger picture. Second, I wish they could print out your rider history on a ticketing machine. That would be helpful. Third, TransLink's software upgrades and possibly changing their current cards to the more common non-chipped contactless card should help with better response time.